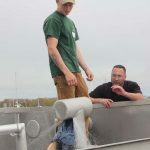 Groton – Chris Fowler knows the perils of his occupation as a commercial fisherman, consistently ranked one of nation’s the most dangerous jobs. 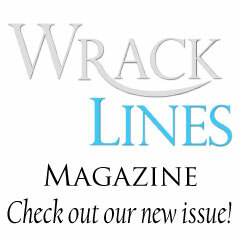 So a year after he began catching skate, whiting, squid, flounder and fluke from a vessel docked in New London, he took a day off from fishing to equip himself with the skills he needs to survive an accident at sea. 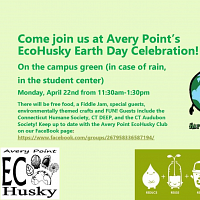 “This is my first training since I started as a fisherman,” said Fowler, his face wet after a drill that involved getting into an bright orange immersion suit, jumping into 50-degree water off the docks at UConn’s Avery Point campus and climbing onto a four-man life raft. 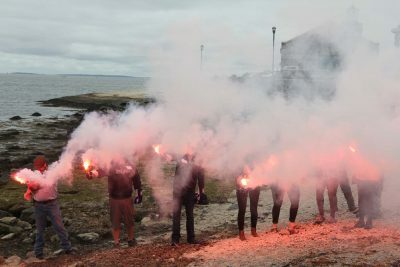 Fowler was one of 36 commercial fishermen and state agency personnel who took part in a daylong safety and survival training course on May 10 sponsored by Connecticut Sea Grant, Fishing Partnership Support Services, the U.S. Coast Guard and UConn-Avery Point. The training began with classroom lessons on first aid, use of life jackets and opioid awareness. 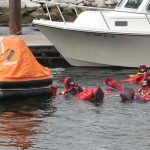 Then the fishermen and agency staff headed to the waterfront for training in firefighting, making emergency vessel repairs, using immersion suits and life rafts and use of flares to signal for help. “Fishing is the most dangerous occupation, so our focus is to give hands-on training so they know what equipment to use and how to use it,” said Ed Dennehy, director of safety training for the Fishing Partnership. Commercial fishermen aren’t required to take safety and survival training courses, he said. “The only requirement is that they run man overboard, fire, flooding and abandon-ship drills once a month while they’re fishing,” he said. 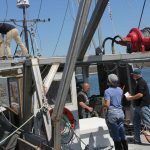 The National Institute for Occupational Safety and Health, however, recommends fishermen take formal training classes like this one at least every five years. 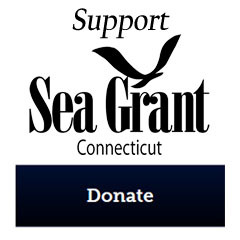 Connecticut Sea Grant has been sponsoring them with various partners about every two years since 2000, and teamed up with the Fishing Partnership in 2016, said Nancy Balcom, associate director of Sea Grant and lead organizer of the training. 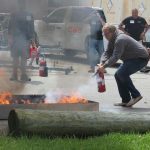 About 80 percent of those at the May 10 class were first-timers, Dennehy said, and the rest were getting refresher lessons. Just last February, four fishermen survived the sinking of their vessel off Martha’s Vineyard using skills they had learned in a training course, he said. But two years earlier, he added, another group of New Bedford fishermen died because they were unable to get their immersion suits on in time. 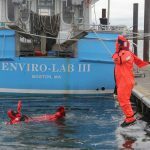 On May 11, 13 fishermen and state agency staff returned to Avery Point for a second day of training to become certified as drill conductors – those who run the monthly on-board safety drills. Michael Theiler, a commercial fisherman out of New London, brought his vessel Emma & Maria across the river to Avery Point for the day so his fellow fishermen could practice their drill conductor skills in an authentic setting. 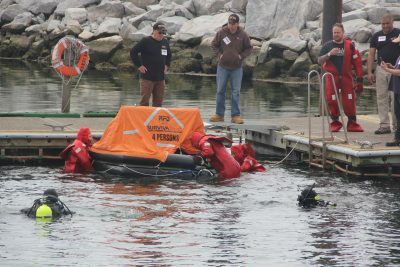 Fisher Harris, one of the fishermen in the safety and survival training, said the experience was both fun and a sobering reminder of how quickly small accidents can turn into disasters without proper preparation. Harris fishes on the vessel Ad Hoc, which docks in Guilford. 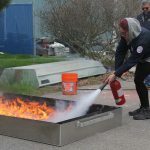 “I’m definitely more confident now that if I ever needed to put out a fire, I could do it,” he said, after learning the most effective way of directing a fire extinguisher onto a blaze. 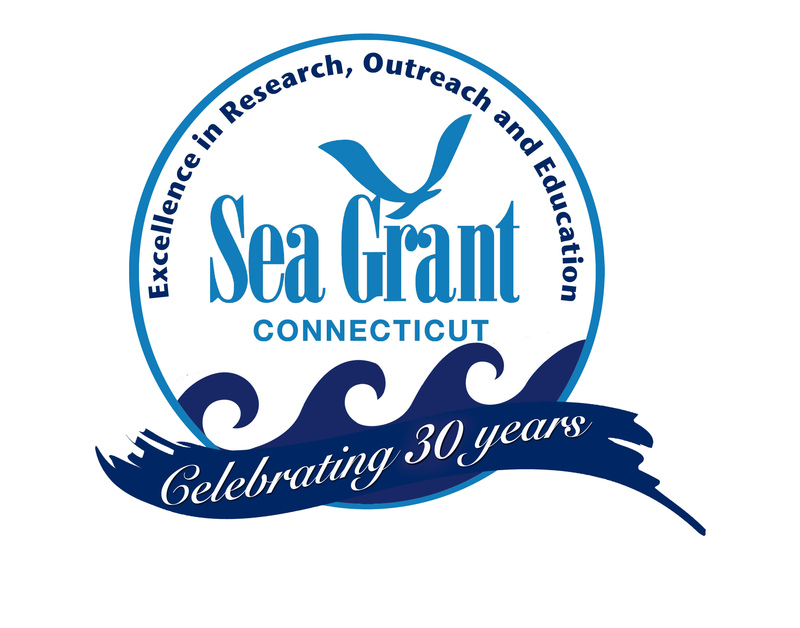 Judy Benson is the communications coordinator at Connecticut Sea Grant. 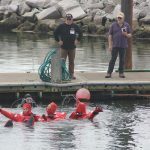 Fishermen jump into the water to practice using their immersion suits. Trainees are taught to form a chain to swim towards the life raft. Trainees reach the life raft. 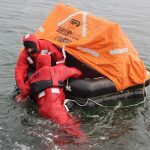 Commercial fishermen practice getting into a life raft. 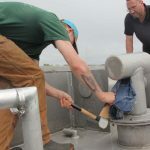 Fisherman Chad Davenport hammers a wedge into a leaking pipe to make an emergency repair as Steve Pigeon, commercial fishing safety examiner with the Coast Guard, looks on. Trainer Steve Pigeon and fisherman Chad Davenport test how well the emergency repair worked to stop a leak. 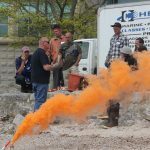 Ted Williams, marine safety coordinator with Hercules SLR Inc., shows one of several kinds of emergency flares. 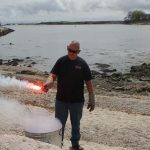 Ted Williams of Hercules SLR Inc. teaches fishermen about different types of emergency flares. Fishermen practice extinguishing a fire. 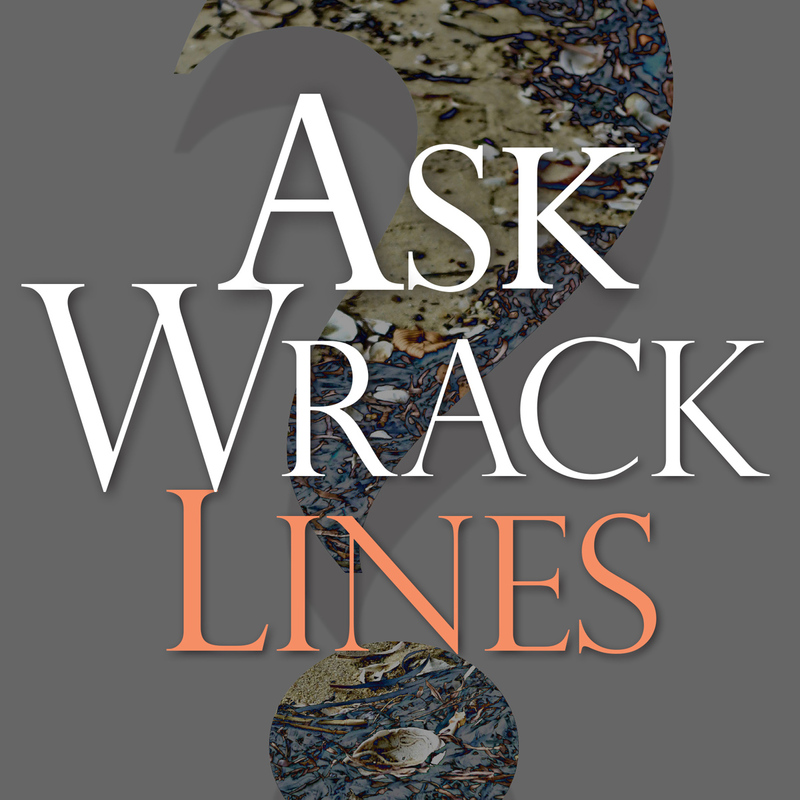 Fishermen were taught to crouch low and move quickly around the fire to extinguish it. Alissa Dragan, center, and Kristin Russo, right, of the CT Bureau of Aquaculture, were among state agency staff who took part in the training. Fishermen practice an abandon ship drill aboard Michael Theiler’s vessel during drill conductor training on May 11. 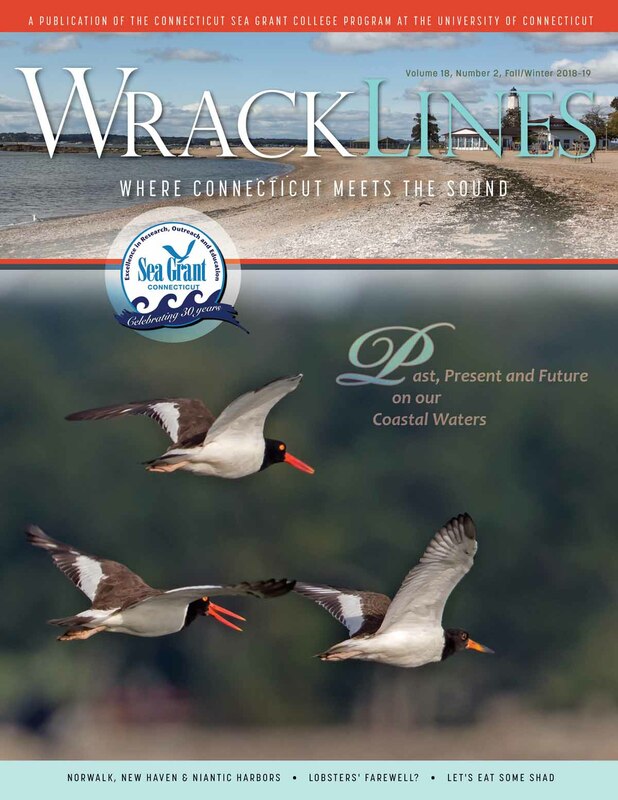 This entry was posted in News and tagged 2018, commercial fishing, Connecticut, Fisheries, New England, safety training, Sea Grant.